This was a simple project. 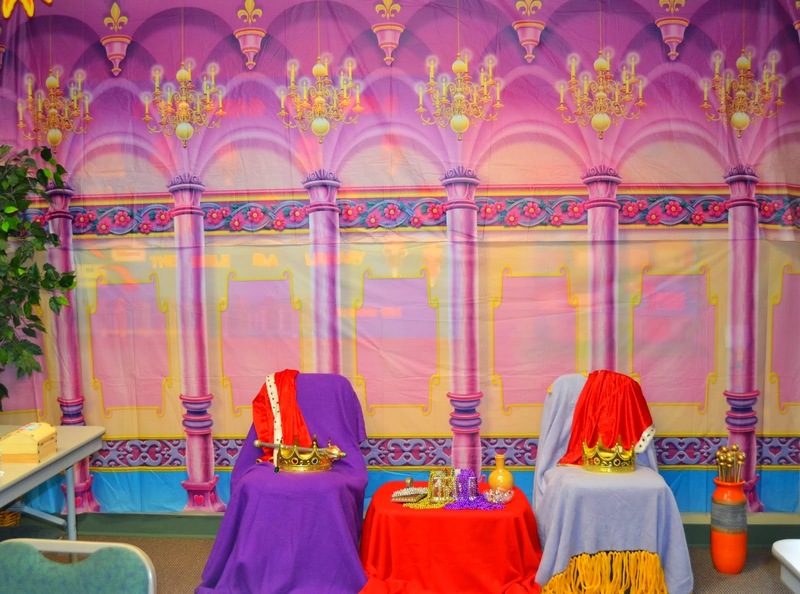 I had seen this really cool room on Debbie Jackson's blog for the story of Queen Esther. I fell in love with her backdrop. In fact, I coveted it! After diligently searching the internet I found it, only to learn that it was no longer available and it would have been over $35 if it had been. Not very good for a blog about being frugal. I kept feeling like there was another way to do this, but I could not envision it. So I did what I always do in these situations, I let it incubate in my mind. It never ceases to amaze me how God puts the answer together for me. I just see something or think of something that fits the bill. So for this project, it came to me – purple plastic tablecloths. The kind you get at the Dollar Tree. Then I needed a way to hang them up. I wanted them to hang like curtains, so I could have pleats in them to make them more royal looking. There may be a cheaper way to do this, but I bought 2 plain, long curtain rods and had someone hang them for me at the top of the wall I was using. Then I bought 6 tablecloths (actually, I found a few somewhere in the church, so I only had to buy 3). I turned the top down and taped it all the way across to make a pocket to slide over the curtain rods. I hung them from the rod and had my background for about $15 including rods and tablecloths. The thrones presented another problem. We didn’t have any chairs with arms on them in the church. I could not think of what I had at home that I could transport. Then it hit me – folding lawn chairs. The old fashioned aluminum kind. 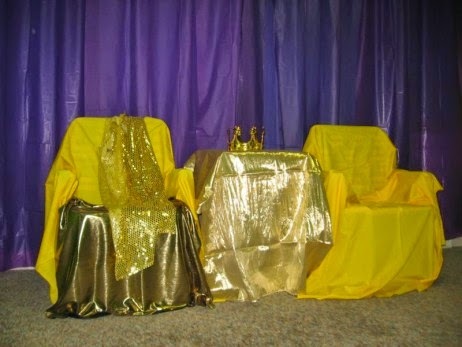 I had a long piece of goldenrod-colored cloth I cut in half to cover the “thrones” with. We also had some shiny gold cloth in our resource room. I just took a short rolling cupboard and covered it with some of the gold cloth to put the crown and scepter on. And voila! I had my throne room - fit for a king, or a queen in this case. 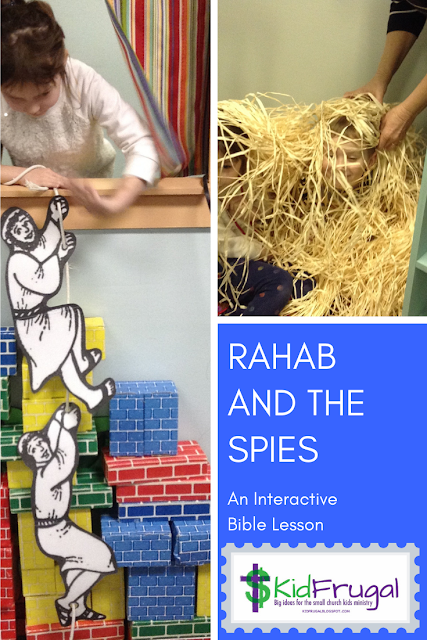 I reused the plastic curtains when we did the lesson on The Writing on the Wall from Daniel. See the instructions here.